Folk architecture reservation Vlkolínec Village was entered in the List of the UNESCO World Heritage List at Cartagena (Columbia) in 1993, based on the criteria (iv) and (v). Criterion (iv) means that Vlkolínec represents a type of rural settlement which features the wooden architecture of mountain and sub mountain areas with the intact fabric of log cabins amidst a landscape of fields and pastures. It is the best conserved settlement of its kind in the Carpathian Region. Criterion (v) means that the locality is a rare example of traditional human settlement and land use which is representative of the given culture, and potentially vulnerable to the effects of irreversible change. It is a set of 45 buildings with many unique construction features and elements. The Vlkolínec Monument Reserve forms part of the city of Ružomberok, in spite of being completely separated from the city. It lies 7 km south of the city in the Veľká Fatra National Park, in the inner Western Carpathians south of the city. The dominant feature of the territory is its natural scenery with the tallest peak of Sidorovo (Hýrová, Žiar, 1,099 metres). Vlkolínec is situated at its foothill at an altitude of 718 metres above sea level. 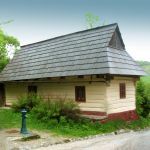 The settlement is accessible from the Ružomberok-Banská Bystrica road via the village of Biely Potok. The first indirect reference to the village was in a historic document of King Louis (Lajos) I (1326-1382) dating from 1376. However, a settlement is known to have existed here since time immemorial. Traces of settlement from the 10th to 12th centuries have been found in the immediate environs of Vlkolínec. The medieval history of the village is connected with the estates of Likava and Ružomberok. The name Vlkolínec (literally ‘Wolf’s Place’) is probably connected with the duty of villagers to maintains the wolf pits as set out in a regulation dating from 1625. 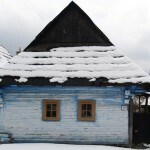 Life in Vlkolínec was always connected with the use of meadows, pastures and thin stripes of fields where basic farm crops were grown and farm animals were kept. The locals lived off farming, shepherding, cattle raising and logging. Today the village is still closely connected with the surrounding landscape, bearing many features of the past. It is a village with long and deep courtyards, common to several houses. Thanks to its peripheral location and partial isolation, there have survived here not only the historic characteristics of the settlement and the landscape but also the outer appearance of houses and structures, which were built in folk architecture style and have mostly been conserved along with their historic interior furniture and fittings. Residential houses with their economic hinterland (shops) are built in rows on both sides of the winding road and brook. 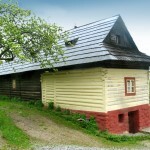 The local folk house is of a characteristic Central Slovak log cabin type. The homestead normally consists of a house, a stable and tiny shops with a barn located behind. Each log house stands on a stone socle and is covered by a saddleback shingle roof with gables which end in a half-circle decoration. Walls are smeared with clay and painted with lime in various colour hues. A typical three-section house is entered from the courtyard. 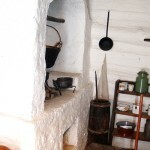 A stove with a hearth in the back part of the entrance hall provides heating. The majority of houses in Vlkolínec date from the mid-19th century. Apart from houses, shops, stables and barns there are also haylofts, granaries and pantries/storerooms in the village. A shingle-covered belfry dating from 1770 and ending in a cross survives in the centre of the village. Its main function was to announce the time of prayers, but the bell also warned of fires and other dangers. The village also includes a 12 metre-deep well, the source of drinking water. Among the stone buildings is the Church of the Visitation of the Virgin Mary, rebuilt from an earlier chapel in 1875. It is a single-nave structure with a presbytery and an in-built tower. It is still the most important place for social interaction between the villagers and visitors to Vlkolínec. On the right side of the road leading to the cemetery and the church, charmingly sited in a natural setting, is a brick former school building which dates from the end of the 19th century. Opposite the church is the cemetery with a number of interesting tomb crosses. A brook set in wooden troughs flows through the centre of the village. Scattered throughout the surrounding area are various types of wooden haylofts, stables, barns, granaries and lattice fences. Vlkolínec is not an open-air museum. It is a live settlement where people live and work, where cattle graze in meadows and pastures. Vlkolínec is a remarkably well-conserved and intact example of a Central European mountain and sub mountain region settlement. It has been subject to few changes and represents the best-preserved and complete set of original folk structures in a wider context of the surrounding countryside.